"Next to the altar was the table "whereupon the shewbread was" (I Kings 7:48; II Chronicles 4:19). The showbread was obviously not of flour, but of silver or gold; in the Book of Exodus12 it is said that showbread was made by Bezaleel, who was a goldsmith. Showbread is pictured on the bas-relief of Karnak in the form of a cone. The cone in the seventh row (138) bears the explanation: 'White bread." This bread was of silver. 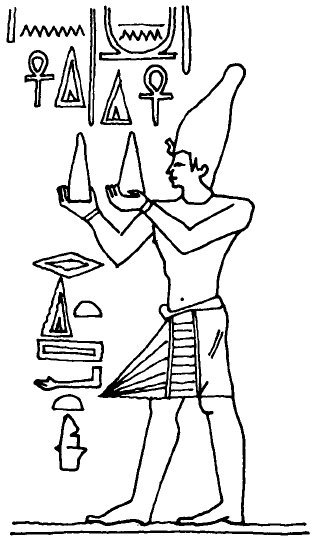 The thirty cones of gold (48) and the twenty-four cones of colored stone (malachite) (169), identical in form with the silver cone, also represent showbread." Velikovsky clearly implied that some of the shewbread was gold and some was silver. "I think this next slide is one that, just the picture says it all. It doesn't need any explanation. Once you understand this. The "Guardian of the Secret". Now pull it on over so they can see the picture. The King offers him the Anubis, the digestive system the White Bread, that is the white nourishment. The picture tells the whole story. 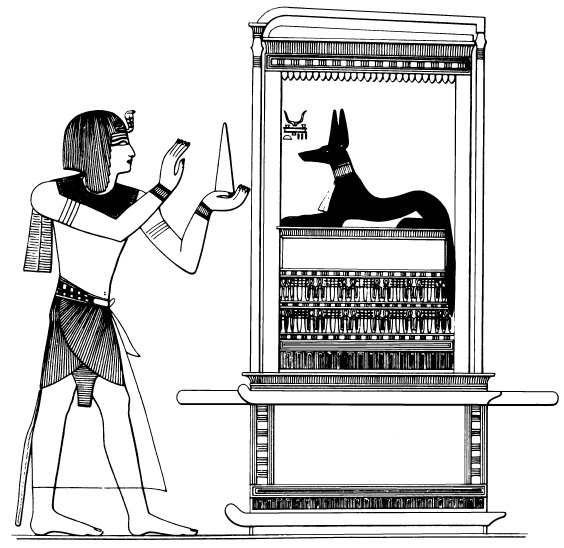 See, the black Anubis represents the digestive system, and here he is, the King with the white powder offering it to the digestive system, and it's called the Opener of the Ways, the Keeper of the Secret." Scientists all over are rediscovering that pyramids accumulate energy just by their shape. 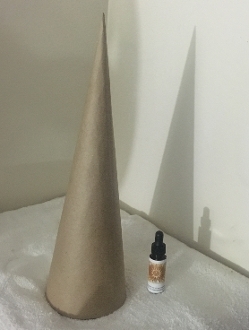 The cone shape is the female version since it has a round end instead of angles like a pyramid. It is said that this has infinite sides so it is even more powerful than a pyramid shape but I'm sure the energies are subtle. I made this to have a cone within a cone to charge Ormus products if one desired. A tesseract is a cube within a cube so what would a cone within a cone be. The next dimension in charging up Ormus that's for sure. I left the outside blank but one could decorate the outside of the cone with whatever they want. You could tag it with Egyptian art or come up with your own design. I've seen a lot of beautiful Orgonite pieces lately but some seem to forget the basics. 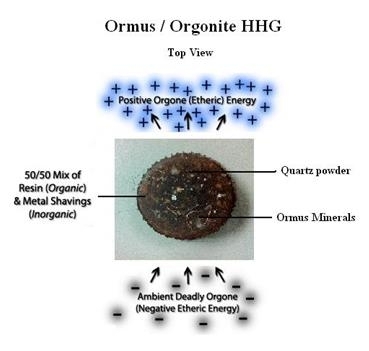 To generate positive Orgone energy you need layers of Organic and Inorganic materials. So I used Copper (Also available Zinc) BBs which are inorganic in an organic resin. Within that resin I put crushed up Rose Quartz for cleansing of energies. 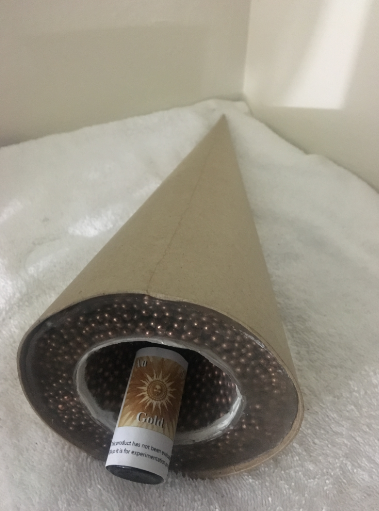 If you don’t have some type of quartz powder to cleanse the Orgone energies you could be attracting negative orgone energy that is detrimental. You can use these to charge your Ormus or other elixirs by simply placing this Orgonite near it as well as inside it. That’s what I do with mine to keep my products with a high loving vibration. I also love to use these as a coaster for charging my personal drinking water.